Many local senior citizens remember when land on both sides of Shelburne Road (U.S. 7) was open farm land. 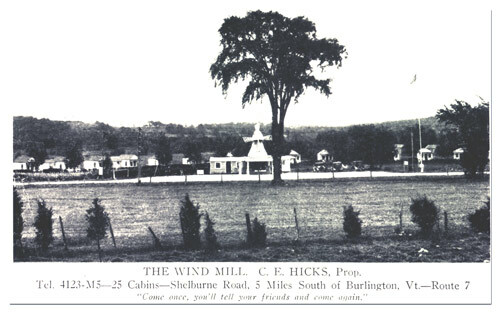 This started changing in the mid ‘20’s when on this property, where the Dutch Mill Restaurant - Motel - Shelburne Camping Area now stand, the original windmill building and 25 overnight cottages were built in a crscent lined with poplar trees. Two houses were built and each was destroyed by fire. A third house was built with 12 rooms where the Bissonettes raised three sons and a daughter. In 1982, the house was remodeled into the present gray office building just north of this restaurant. The cottages were the only accommodations of their kind in the northeast. There were two outhouses which were the only toilet facilities for the whole complex. The linens were laundered and hung to dry along the walk down through the spacious lawn. Many fascinating stories have been told about activities during the prohibiition days. Seniors also relate to the thrills of seeing the lighted dome and windmill blades. Since it was built, there have been six owners. Charlie and Corrine Bissonette purchased the property from Carlton hicks in 1968. They added 14 cedar chalets (moved down from Canada) and the Bissonettes received an received an award for preserving this landmark. Some of the cottages had to be removed; material was then used to build the dwelling at the end of the motel. Shelburne Camping Area was established in 1973 behind the motel. Since opening the the Bissonette’s have owned the campground involving family as much as possible. Four generations operate hands on day to day. Rt 7 and the Burlington area has grown but when entering the campground drive it still has a ountry setting. Although Burlington and interstate 89 are only four miles away. The Dutch Mill Family Restaurant opened in July 1995--- construction again being done by the Bisonettes. Much of the material from the older cottages was used in this restaurant. The counter section was built from one of the dying poplar trees from the crescent. Enjoy the home-style cooking in the historic landmark building, and do come again.